The temperature of babies may rise and drop on a regular basis but since they can’t express how they feel, you need to keep a close watch on them to ensure that they are in a perfect state of health. The ability to take a quick reading of your baby’s temperature will go a long way to keep you informed on when to worry, give medication or even call the doctor. For this reason, it advised keeping a good thermometer close by at all times. There are many different brands of thermometers on the market but not all of them work as advertised. In order to help you check the state of your little one’s health properly, as well as save time and resources, this post will provide you with all the information you need to make a quick and simple decision. Read on for a detailed baby thermometer buying guide as well as a list of the best ones on the market. The accuracy of the readings provided by the product you are about to purchase is one of the most important factors to consider when buying the best baby thermometer. A thermometer that displays false reading will let you relax when you should be worried or vice versa. This may be dangerous to your little one’s health as you may not know the right time to call the pediatrician. Consider purchasing a product with accurate readings for the best experience. Another important factor to consider when looking to purchase the best baby thermometer on the marker is the speed of readings. While some products are designed to provide you with an accurate result as fast as 1 second, there are a few others that will take more than a minute to complete the reading process. It is best to purchase a baby thermometer that gives fast results as it will help you to take quick steps with regards to your baby’s health. You should consider purchasing a product that is easy to use and read. This will go a long way to simplify the process of taking your little one’s temperature. Also, consider choosing a product with large displays coupled with LED backlit for clear readings during the day and at night. Ensure that the baby thermometer you are about to purchase is not made from any harmful or toxic material for your little one’s safety. The product should also be FDA and CE approved for use in newborn babies, infants, and toddlers, as well as pediatrician recommended. Another factor to consider when buying the best baby thermometer is the cost. This factor is especially important if you are buying on budget. Baby thermometers are reasonably priced and you can get a good one for as allow as $15. Also, you may want to go for a thermometer that ships with a warranty as this will allow you to get a refund or replacement if the product falls below your expectations. The Kinsa QuickCare Smart Digital Thermometer is one of the best you can find on the market. It is designed to cater to the needs of individuals in all age groups and it will be a great choice for newborn babies, infants, and toddlers. The product is a digital Bluetooth Thermometer that is designed to provide you with an easy connection to your smartphone. Kinsa will work efficiently on Android devices that run on 5.0 operating system or more and on iOS devices running on iOS 10 or more. It is easy to use and the maker stated that results are fast, reliable and accurate. With this thermometer, you can get a result as fast as 8 seconds or even less. To further make it easy for you to use, the Kinsa QuickCare Smart Digital Thermometer is lightweight as it weighs only about 0.64 ounces. You don’t have to worry about the safety of this thermometer for your little one as it is pediatrician-recommended. Also, the product is FDA certified for accuracy as an underarm or oral digital thermometer for people of all ages as well as a rectal thermometer for babies. If you decide to purchase the Kinsa QuickCare Smart Digital Thermometer, you will find that although it is not waterproof, it is water resistant for enhanced durability. The product requires 1 lithium metal battery to work properly and it may interest you to know that the battery is included in the package. Also, the maker of the product stated that the battery has a long life span. The device will function efficiently for up to 2 years if it is used on a daily basis. Cleaning the thermometer is also a breeze since you can complete the process within a few minutes using a cotton swab or a soft towel with 75 percent alcohol. Unlike many products on the market, the Kinsa QuickCare Smart Digital Thermometer do more than just provide you with number readings. This is ideal for parents who are not informed about the readings. The thermometer also tells you how and when to manage your little one’s symptoms, as well as when to take medications or even call the doctor. Also, has a large backlit display for easy reading. You will find that the readings are in °F or °C. The tip of the thermometer is flexible and comfortable for individuals of all ages. In addition, the Kinsa QuickCare Smart Digital Thermometer is easy to set up as the entire process will take you about 90 seconds to complete. The product is cheaper compared to similar ones on the market. Most users of the thermometer are satisfied with its performance, quality, and accuracy. However, a few users complained that the readings provided by the product are inaccurate. Others stated that it may stop working well after repeated use. 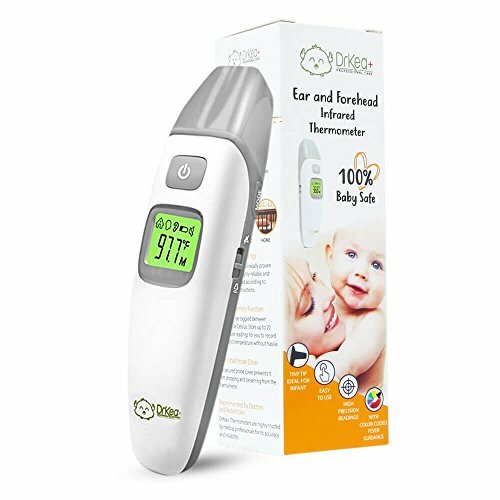 The DrKea Baby Forehead and Ear Thermometer is another amazing product to buy on the market. It is an advanced infrared model and it is considered one of the best baby thermometers you can find. The product is specially designed to cater to the needs of newborn babies, toddlers, and infants. Unlike similar products on the market that are designed to check your little one’s temperature orally or under the arm, this one is to be used by placing the tips in your baby’s ear or on the forehead. This method is believed to be easier for you and more comfortable for your baby. The DrKea Baby Forehead and Ear Thermometer is easy to use even for parents that are not experienced with the readings. To further enhance the experience of your little one, you will find that this product reads temperature really fast. The makers of the thermometer stated that you will get an accurate and reliable reading as fast as 1-second. It features a large display to further make it easy for you to use. You can toggle between forehead, ear, and room temperature by hitting a button designed for this functionality. You will find that the product features icons to show you the selected function. The readings are in degree Fahrenheit and degree Celsius. You can switch between them by holding the MEM button for about 3 seconds. You may also not encounter any issue with this product in terms of safety as it is recommended by Pediatricians and Medical Professionals for reliability and ease of use. It is also FDA and CE approved for use in babies, infants, and toddlers. The DrKea Baby Forehead and Ear Thermometer come fully set and assembled. You can go ahead to use it as soon as you take it out of the pack. It is ideal for babies that are at least 3 months of age. Also, you can use this baby thermometer at night without disturbing the sleep of your little one that to the LED backlit for clear vision in the dark and the silent mode option. The product requires 2 AAA batteries to work properly which is included in the package. It also ships with a hygiene dust bag to make it easy for you to store the product. The DrKea Baby Forehead and Ear Thermometer is offered at an affordable price and it ships with a 365 days replacement guarantee. It also ships with a 30 days manufacturer warranty. Most users of the product are satisfied with its performance and quality. Yet, a few users complained that the readings offered by the thermometer are not accurate. Others stated that the product may stop working well after repeated use. If you are looking to purchase a high performance and easy to use baby’s thermometer that is offered at a budget-friendly cost then you should consider checking the product out. 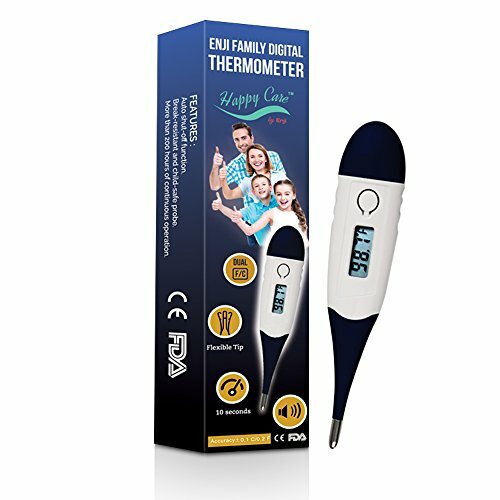 The Enji Prime Digital Medical Thermometer is considered one of the best for babies even though it can also be used for adults and seniors. The product is designed for high performance and to provide you and your little one with the best experience. It is popular among parents and it has received many favorable ratings and reviews from past users. Furthermore, you can check your baby’s temperature using different methods including rectal, oral, or by placing the device under his/her arms. The maker of the Enji Prime Digital Medical Thermometer stated that readings are quick and accurate. However, the time it takes to provide you with readings will be dependant on the method you use. The reading is complete when you hear a beep. 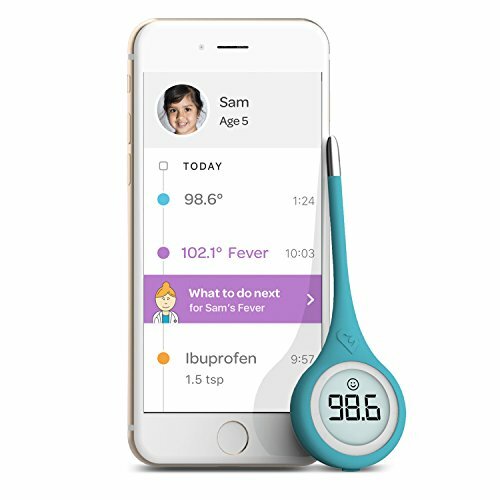 The product features a display that shows readings clearly to further make it easy for you to take your little one’s temperature. Also, it is lightweight as it weighs only about 0.6 ounces with a dimension of about 5.4 x 2.2 x 0.7 inches. This means you can easily carry it along when going on a trip. In terms of safety, one can safely conclude that the Enji Prime Digital Medical Thermometer is safe for use in babies. The maker stated that it is mercury-free, CE approved and clinically tested thereby making it safe to use for babies, infants, and toddlers. It is recommended to use this thermometer for babies that are at least three months of age. The Enji Prime Digital Medical Thermometer ships with a protective storage case that helps you keep germs and bacteria at bay. It features a waterproof construction to enhance durability in good condition. Also, you will find that the tip of the baby thermometer is flexible and comfortable to enhance your little one’s experience. The readings are in Fahrenheit and Celsius. You can choose between the two by pressing the button designed for it. This product can be used to check the temperature of pets too. The Enji Prime Digital Medical Thermometer is one of the cheapest you can find on the market. It ships with a lifetime accurate temperature guarantee to further assure you of its quality. Also, it ships with a 1-year warranty. Most users of the baby thermometer are satisfied with its quality and performance. However, a few users complained that the product does not work. Others complained that the readings provided by the product are not accurate. 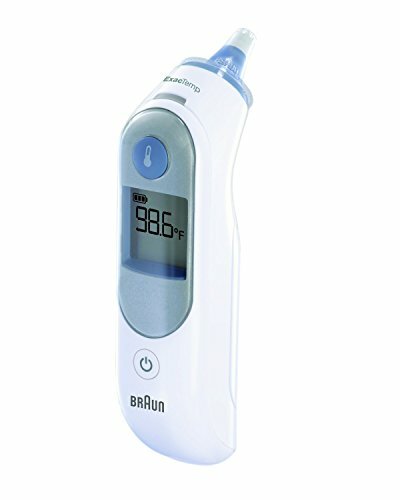 The Braun Digital Ear Thermometer ThermoScan is another amazing product you should consider purchasing. Unlike many products on the market, this one is designed to take temperature via the ears and forehead for the best result. It is designed for use in individuals of all age groups and will be a great choice for newborns, infants, and toddlers. This is especially because the baby thermometer is designed to take temperatures gently and carefully without causing any discomfort for your little one. Furthermore, the maker of the Braun Digital Ear Thermometer ThermoScan stated that readings are fast and accurate with the product. 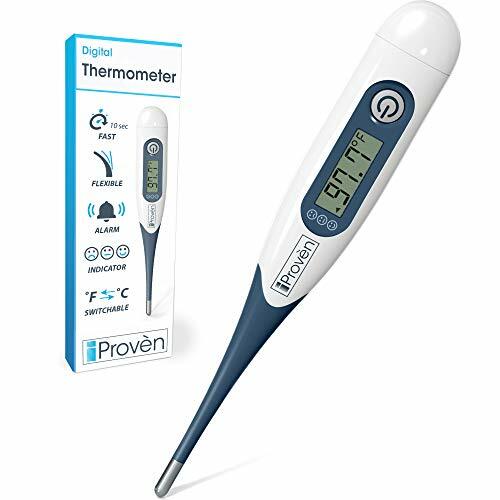 The thermometer features an innovative pre-warmed tip to provide you with more accurate results compared to that provided by products with a cool tip. Also, the product features easy to use controls with a large display that clearly shows readings during the day and at night. It is portable and lightweight as it measures about 1.5 x 1.9 x 5.8 inches and weighs 6.2 ounces. This invariably means you can easily carry the product from one place to another. In addition, the Braun Digital Ear Thermometer ThermoScan records the last temperature reading thereby allowing you to keep track of your baby’s health. It is easy to clean as it can be cleaned using a soft damp cloth or cotton swab with 75 percent alcohol. Also, it requires 1 AAA battery to work properly but you will not have to purchase this as it is included in the package. In terms of assembly, the baby thermometer comes pretty assemble and ready for use. The Braun Digital Ear Thermometer ThermoScan is slightly more expensive compared to similar products on the market. But looking at the benefits it offers, one may safely conclude that it offers a good value for money. 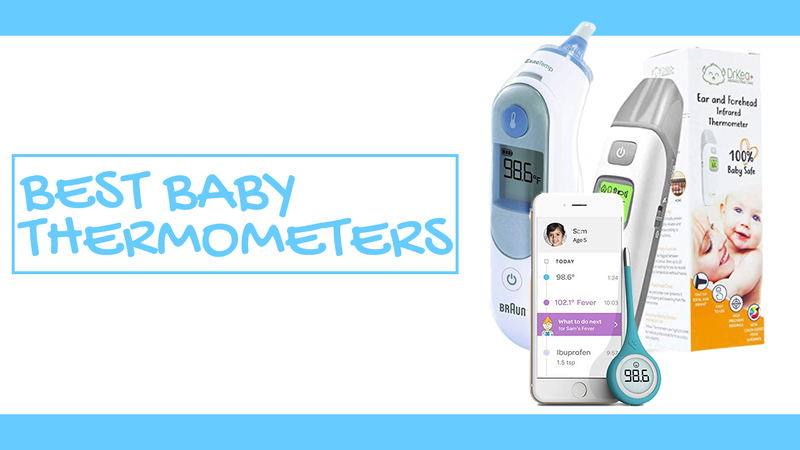 Most users of the baby thermometer are satisfied with its cost, performance, accuracy, quality, and durability. Nonetheless, a few users complained that the product may stop working after repeated use. Others stated that the readings are not accurate. The Oral Thermometers Digital Medical Thermometer is one of the best you can find on the market. It is designed for use in both babies and adults. The product is lightweight and portable with a weight of about 1.4 ounces. This will allow you to easily carry the product with you from place to place. The maker of the thermometer stated that readings are fast as the entire process may only take you about 10 seconds to complete. It is easy to use and all you need to do is place the thermometer in your preferred location, and wait for the beeping sound that signifies that the reading is complete. There are different ways to use the Oral Thermometers Digital Medical Thermometer including under the arms, orally and rectal for babies. Also, if you purchase this product, you will find that results are accurate thanks to the optimized algorithm system featured in the thermometer. The thermometer is safe for use in babies and the maker stated that it was extensively tested before it was supplied to the market. The Oral Thermometers Digital Medical Thermometer is comfortable too as it ships with a flexible tip. Also, it features a waterproof construction for enhanced durability. This features also make it easy to clean. To further ensure that the baby thermometer is germ and bacteria free at all times, it ships with a hard protective case. The Oral Thermometers Digital Medical Thermometer is offered at a budget-friendly cost and many users stated that it offers a good value for money. It ships with a 100 days money back guarantee. Most users of the product are satisfied with its quality and performance. Yet, a few users complained that the thermometer does not work. Others stated that the readings provided by the product are inaccurate.